Steed demonstrates the anatomage table. 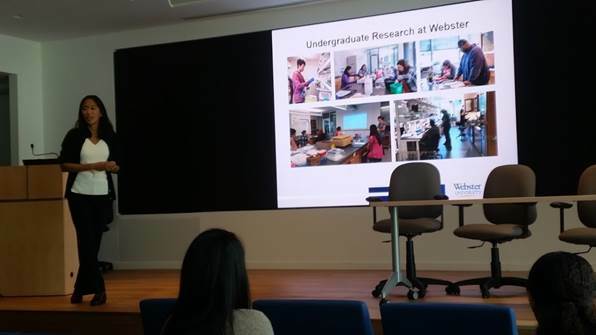 The Department of Biological Sciences and Department of Nursing teamed up with the Transfer Admissions team to host more than 40 students, faculty, and staff from St. Louis Community College for a special event, "Discover the Sciences at Webster University." The students enjoyed an academic presentation from the departments where they learned more about Webster’s academic offerings in biology, chemistry, exercise science, and the RN to BSN program. Students interested in biology and chemistry had an opportunity to ask questions of a panel of current WATTS students (Winning Approaches for Talented Transfers in STEM), who shared their transfer experiences to Webster. Our guests also learned more about Webster’s WATTS scholarship program for transfer students in biology and chemistry, funded by the National Science Foundation S-STEM grant program. 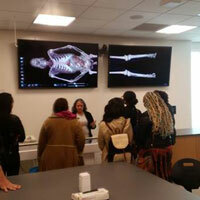 All students enjoyed a faculty-guided tour of Browning Hall, including a special demonstration of the anatomage table by Martina Steed, director of clinical education. The Gorlok also stopped by to greet our guests!